I don’t think we could of been more excited to be heading to New Orleans, as we flew out of Vegas we crossed over the Grand Canyon once again. It felt like so long ago that we were there! Again it wowed us and from the plane, compared to the helicopter ride we had taken there, you get even more perspective of how large it is. As we were heading to the south, a few things were on our mind… blues, jazz and southern food. We knew we were in for a treat when there was jazz playing over the intercom as we exited the plane and made our way to baggage collection where there was a live jazz band performing. We stayed just outside the French Quarter, ironically next to the casino considering where we had just flown in from. Quickly into the action we went walking through the French Quarter and two things really hit us in the face, firstly the stunning architecture and secondly the smell. 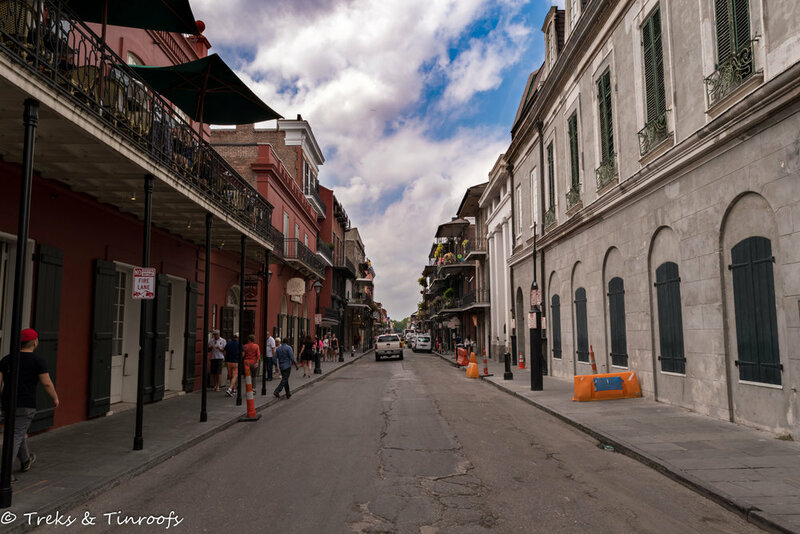 Many of the buildings in the French quarter are original or rebuilt to look the same as when this place was settled back in the 1700's by the French. There really is nothing like it in Australia. Then the smell of the area, terrible at times but you do get reasonably used to it after a couple of days. It reminded us somewhat of Bali back when they had the open sewers on the side of the streets. Yep that bad! We started our first evening getting into true New Orleans spirit so to say with a walking ghost tour of the area hearing all sort of freakish stories of supernatural experiences, this place has amazing history and wanted to learn as much as we could about it. Afterwards we made our way to Bourbon Street and could hear some amazing music coming out of a small door on a side street, we found ourselves lining up outside at what we now know is called Preservation Hall. Wow we were in for a treat, this place was amazing. If you are ever in New Orleans or have an opportunity to see the Preservation Hall House band play, you must (some were performing in New York that night). It has around 80 musicians who rotate through as well as inviting in special guests. Our first night (yep we went back) they had members of Harry Connick Jr.’s band playing alongside a local trumpet player Will Smith, just amazing music, musicians and venue. But you have to be there early, it can only hold 70-ish and fills up so quickly. We spent the remainder of our days exploring, finding our way along the banks of the mighty Mississippi River, through the French markets to Frenchmen street and meandering through the Garden District. We wandered through the markets to Frenchman street and found ourselves drawn to a bar with a fantastic duo smashing out some great blues. Oh the music, the whole reason why we came here and everywhere we went it was amazing, even the street artists were incredible, you couldn’t help but tip them. We couldn’t get enough of the music so we made our way back to Preservation Hall and to our delight a new group of musicians playing a very different style of jazz, it just shows what an amazing array of musicians this place has in its arsenal. We spent an afternoon wandering the streets of the Garden District (true to its name), home to the rich and famous and one the best collections of historic mansions in America. We found ourselves looking at homes of celebrities such as Sandra Bullock, John Goodman and the Manning family (a family of NFL quarterbacks, dad Archie, and Superbowl winning sons Peyton and Eli) along with famous writer Anne Rice and the house where Django Unchained was filmed. Quite an amazing area rich in history and architecture, we used a self-guided walking tour of the area that helped us find particular houses and explained why mansions were built the way they were back in the 1800’s. The Mrs loved the area, it was so green and the streets were lined with magnolia’s and jasmine. Back to the music scene of New Orleans and a big reason we came here was the New Orleans Jazz Festival. Big name artists covering many genres come together over two weekends of the festival. It wasn’t the big names we were most looking forwards to either, it was the artists we never heard of we hoped would blow us away. What a great day! Everything ranging from gospel through jazz, blues, rock and rap, yes rap. We even came across some of the musicians from Preservation Hall playing with a handful of artists. The festival was our last day in New Orleans and it sure was a fitting way to end an amazing 4 days. Before we end, we have to mention the food! Whoa.. being here reminded us once again of the American portion sizes. We were both so excited to try typical southern food and it didn't disappoint. Fried chicken, Po-boys and Gumbo; yum my mouth is watering just thinking about it all again. From here we ventured to Washington DC.